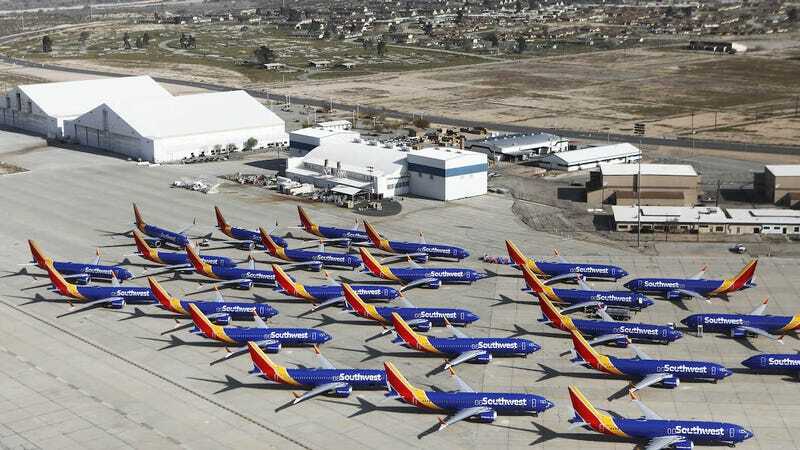 A number of Southwest Airlines Boeing 737 MAX aircraft are parked at Southern California Logistics Airport on March 27, 2019 in Victorville, California. Boeing and the Federal Aviation Administration (FAA) have suggested that the pilots of two flights in Ethiopia and Indonesia didn’t follow proper procedures before their 737 Max 8 planes crashed in recent months. However, new reports indicate that the pilots in Ethiopia tried to do the right thing and override the plane’s automation but crashed anyway. From the day that the Ethiopian Airlines plane crashed, experts have been concerned that the disaster could have been caused by an automation system designed to keep the 737 Max planes from stalling. The Maneuvering Characteristics Augmentation System (MCAS) helps to push the nose of the plane down when it detects that the aircraft might stall. But in the case of a faulty reading, pilots need to override the automation. These new reports suggest that the pilots may have done that, at least initially. According to Reuters, it’s still unclear why the software re-engaged, but investigators are “studying the possibility that the software had kicked in again without human intervention.” And this is where the Reuters and WSJ reports differ because the Wall Street Journal cites “people briefed on the probe’s preliminary findings” to suggest the pilots themselves may have re-engaged the automation. All of the new information has been taken from the doomed flight’s black box recorder which was recovered intact. “We urge caution against speculating and drawing conclusions on the findings prior to the release of the flight data and the preliminary report,” a Boeing spokesperson told Gizmodo over email without going into more specifics. Boeing has received criticism in recent weeks over revelations that key safety features on the new Boeing Max planes were sold as “extras.” For example, a light that would notify pilots when sensors may be giving a false reading to the anti-stall software was not included as a standard feature on the Boeing Max 8. The investigation into what caused the crash of Ethiopian Flight 302 is still ongoing, though all Boeing Max planes have been grounded around the world. It was the second crash of a Boeing Max 8 plane in five months following the crash of Lion Air flight 610 off the coast of Indonesia on October 29, 2018, that killed all 189 on board. A report with preliminary findings of what actually happened to Ethiopian Flight 302 is expected in the coming days. Update, 12:00pm ET: Added comment from a Boeing spokesperson.